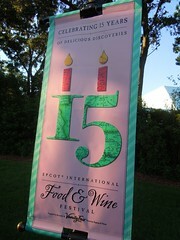 This year marked the 15th year of the Disney International Food & Wine Festival held at the World Showcase at Epcot. Despite it being in its 15th year, I only learned about it earlier this year and so we had to make a point of visiting to check it out. Martha and I are often huge fans of the World Showcase, making it a point to visit the Marrakesh restaurant in Morocco each time, and this festival was the perfect excuse to go! For the festival, Epcot throws down twenty five kiosks across the World Showcase and each one serves regional cuisine. Most are countries, such as Ireland and South Korea, and a few are thematic like a Hops & Barley for drinks and Charcuterie & Cheese (new for 2010) for … well, cheese. Each kiosk offers one or two (usually two) regional dishes as well as several beverages, such as beer and wine. The prices range anywhere from $2 to $5 and while the servings are on the small side, it does give you the flexibility to sample a lot of places (yes yes, and make Disney some extra money). If you’re on the dining plan, the food items count as a snack. Adding to the fun is a little passport that lists all the countries as well as the foods they offered, which lets you take notes and get the country “stamped.” You aren’t required to purchase anything for the stamps and you can get a final stamp for completing every country. Overall, we visited over half of the countries but there were only two tents we visited twice – Brewer’s Collection (beer!) and South Korea (for the short ribs). The prices for beer were what you’d expect at Disney (or a ballpark) and fair if you consider you can buy beers you wouldn’t normally get. We bought 12 oz. beers of Schofferhofer Weizen at the Brewer’s Collection for $6.50 (something like that), which is the same price you’d pay for a Sam Adams elsewhere. Good luck finding Schofferhofer Weizen at most beer distributors! In addition to the food, there were numerous events at the Festival Welcome Center. There are cooking demonstrations, beverage tastings of beer and wine, and book signings. The cooking demonstrations and beverage tastings cost somewhere in the neighborhood of $9-$15 per person, depending on the event, and we didn’t participate in any because we tended to wander the showcase. At night, there are usually three Eat to the Beat “shows” performed by one performer at the amphitheater in the American Experience. For the weekend, we were able to see a few songs by Jon Secada, an icon from our childhood. We missed out on Hanson since we left Monday night but the line for the early evening show started at 2:30pm! If you’re a fan of food and wine and a fan of Disney, I fully recommend checking out the festival next year.